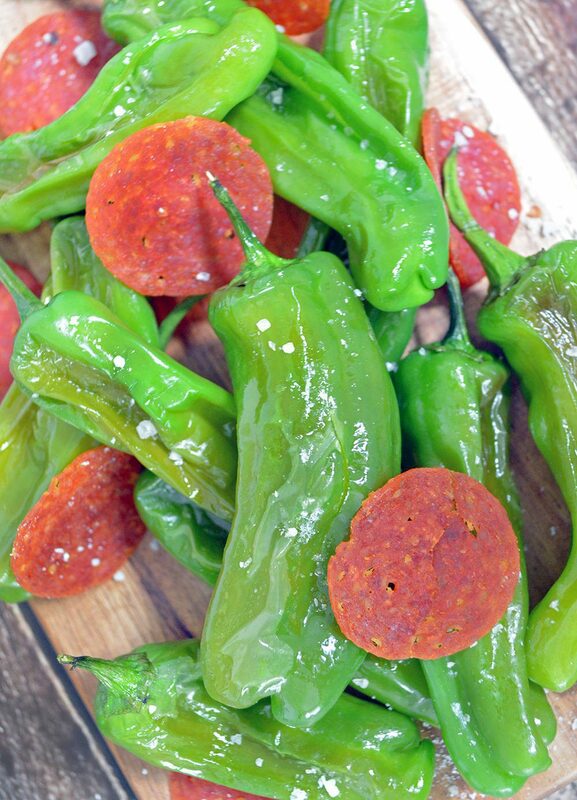 Easy copycat recipe of BJ’s Blistered Shishito Peppers and Crispy Pepperoni. 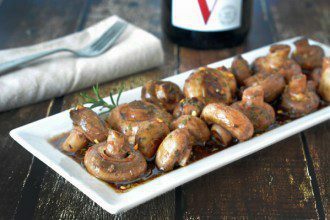 This Keto recipe is easy to whip up and only requires two ingredients. 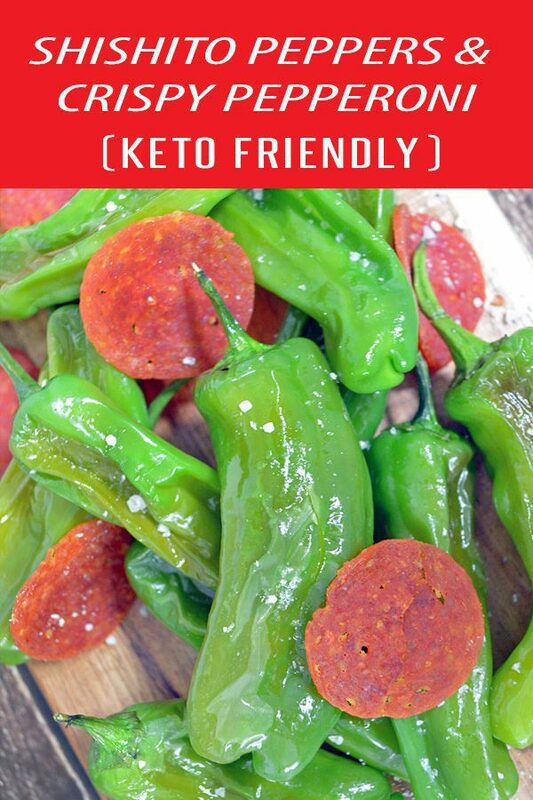 We’ve been noshing on this shishito peppers keto recipe for months….ever since our trip to San Diego in March. BJ’s Restaurants are on every corner and we always stop in for a pint (or two) of their Berry Burst Cider during happy hour. Don’t let this ridiculously simple recipe fool you. 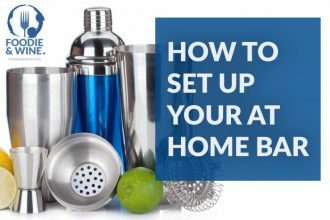 While it’s only two ingredients, the flavor of each item is so dynamic you’ll be left blissfully satisfied and ready to order another batch and round of cider. Another upside of this keto recipe? 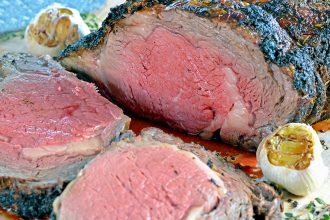 It can be made with just a sheet pan. Cleaning up the kitchen is a drag so anytime we can make a one sheet recipe we’re all in. Pictured below is a mini sheet, since we halved the recipe, so grab a full size cookie sheet if you’re making a full batch. If you haven’t tried Shishito Peppers yet you’re in for a treat. It’s a sweet pepper from East Asian. The caveat? About one out of every ten peppers is spicy which makes shishito peppers super fun to order with friends – it’s like Russian roulette with peppers. 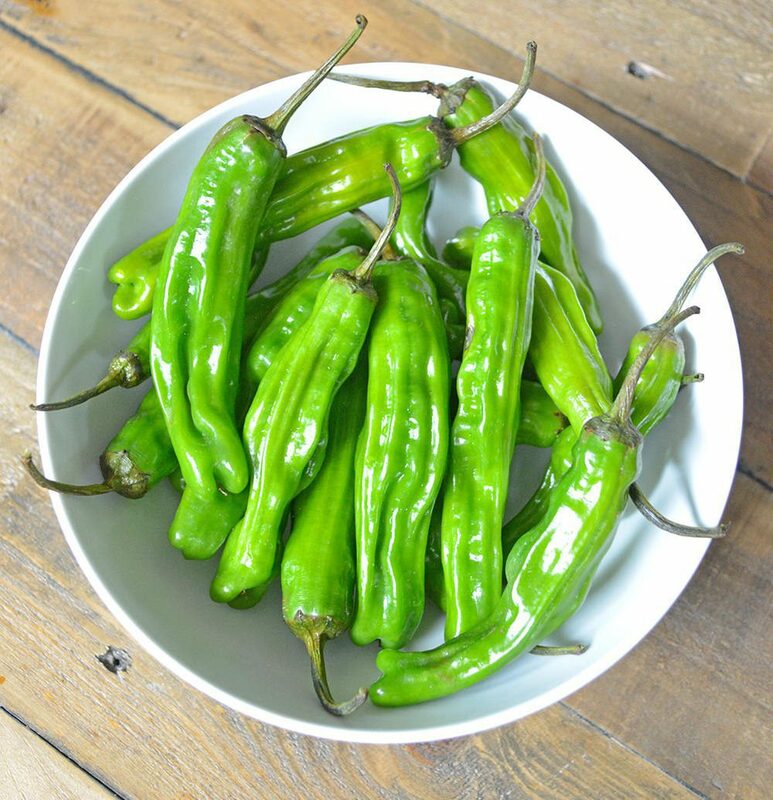 WHERE CAN YOU FIND SHISHITO PEPPERS? A few years back these babies we’re hard to locate, until they exploded on the foodie scenes. Now you can find them at most grocery stores such as Whole Foods or Sprouts. 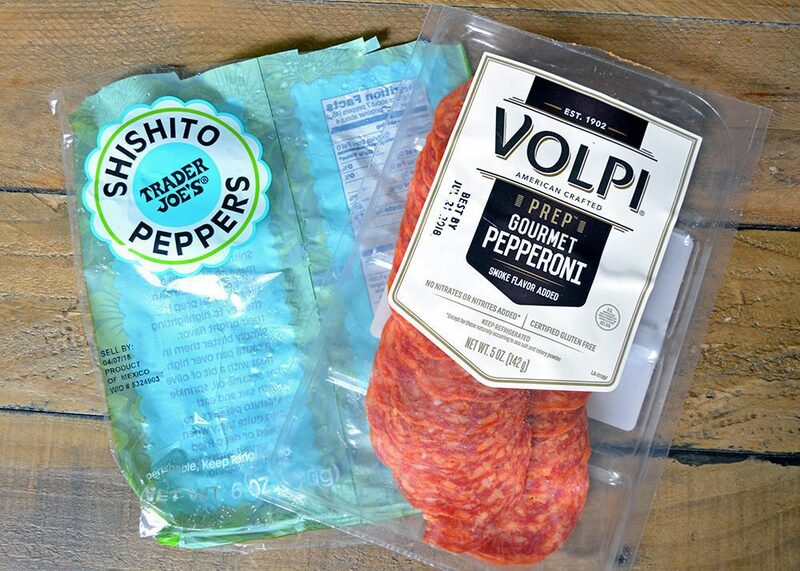 Trader Joe’s carries them for just $2.99 a bag, which is where we snag them along side this package of gourmet pepperoni. If you’re not afraid of extra calories and need some extra fat in your keto diet, feel free to toss the shishito peppers with a tablespoon of your favorite oil before cooking. It’s not needed to blister the peppers, but if you’re into it have at it. Make sure to serve immediately as shishito peppers will wilt and lose their crispiness the longer they sit. Soggy shishito peppers are a travesty. Cooking time varies from oven to oven AND varies depending on the brand/thickness of your pepperoni. In just one minute your pepperoni could burn so keep a close eye on it the first time you make it. Start with 7 minutes and work your way up. Utilizing the Trader Joes brand of pepperoni, a serving of this dish calculates to 201 calories per person if you’re splitting this between three people. That’s a healthy portion of about 12 pepperoni slices each and 6 peppers. Not to shabby. Splitting it between two people? You’re looking at 302 calories per person. 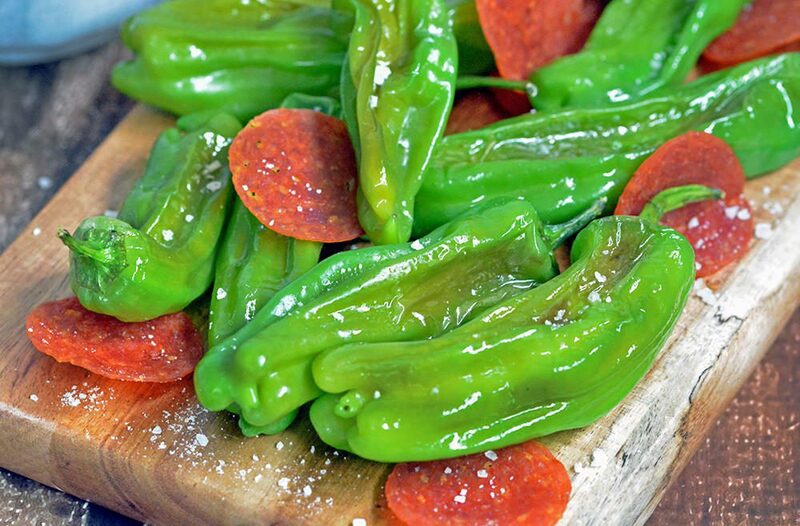 Copycat Recipe of BJ's Blistered Shishito Peppers and Crispy Pepperoni. 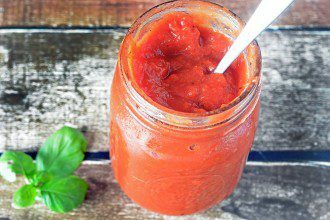 This Keto recipe is easy to whip up and only requires 2 ingredients. Place shishito peppers on one side of the cooking sheet, limiting overlapping as much as possible. 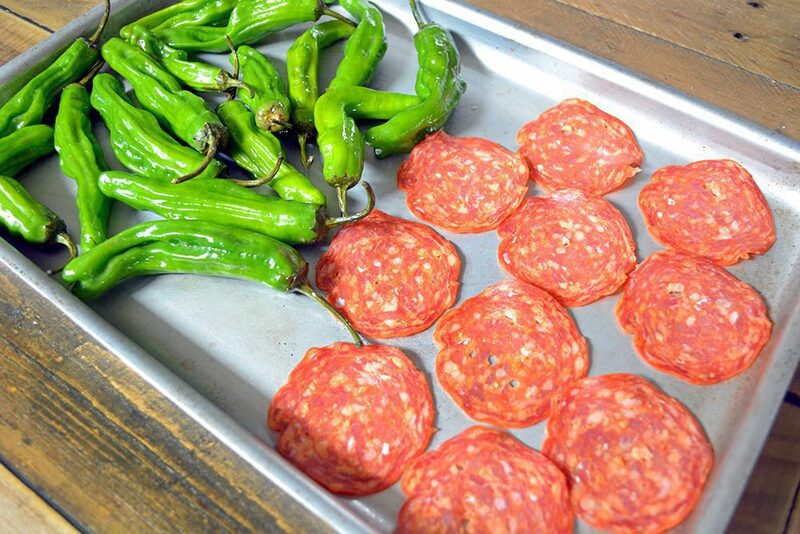 Place individual pepperoni slices on the second half of the cookie sheet, limiting overlapping as much as possible. Bake for 7-9 minutes until the pepperoni is crispy (but not burnt) and the peppers have a bit of blistered char on them. Transfer the pepperoni slices to a paper towel lined plate to soak up excess grease. Transfer the peppers and pepperoni to a service dish, sprinkle with salt (optional) and enjoy immediately.